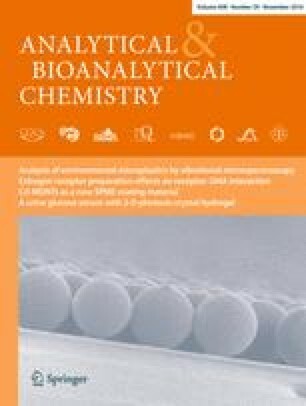 Different highly selective sorbents have been evaluated for the treatment of food and biological samples to determine chloramphenicol residues by ion mobility spectrometry (IMS). Combination of a selective solid-phase extraction (SPE) and dispersive liquid-liquid microextraction allowed a highly sensitive determination of chloramphenicol in water, milk, honey, and urine samples. The performance of selective SPE supports such as immunoaffinity chromatography (IAC) and molecular imprinted polymers (MIP) have been compared in terms of selectivity, sensitivity, trueness, precision, and reusability. Quantitative recoveries were obtained for chloramphenicol residues, ranging from 91 to 123 % for water, from 99 to 120 % for skimmed milk, and from 95 to 124 % for urine using IAC-IMS and MIP-IMS methods. Quantitative recoveries (from 88 to 104 %) were also achieved for honey samples using IAC-IMS, but low recoveries were obtained using MIP-IMS. The limit of quantification was set at 0.1 μg L−1 which is lower than the minimum required performance limit established by the EU. The proposed methodology is a simple and cost affordable alternative to chromatography methods for the highly sensitive and selective analysis of chloramphenicol residues in food and urine. These results were presented as a poster communication at the “XXV Reunión Nacional de Espectroscopía—VIII Congreso Ibérico de Espectroscopía” (XXV RNE-VIII CIE) held in Alicante (Spain) in July 2016 and it won the Poster Prize for excellent presentation of particularly significant innovative analytical research. The online version of this article (doi: 10.1007/s00216-016-9995-9) contains supplementary material, which is available to authorized users. Authors gratefully acknowledge the financial support of the Ministerio de Economía y Competitividad (AGL2012-39965-C02-01-02/ALI, CTQ-2012-38635, and CTQ-2014-52841) and Generalitat Valenciana (PROMETEO-II 2014-077). This study has been approved by the appropriate ethics committee and has been performed in accordance with the ethical standards. The authors declare no competing financial or nonfinancial interest.